CARNIVOROUS PLANTS – A Hobby That Is Not As Hard As You Think! Being a lover of insects, I have also always found carnivorous plants a fascinating subject. 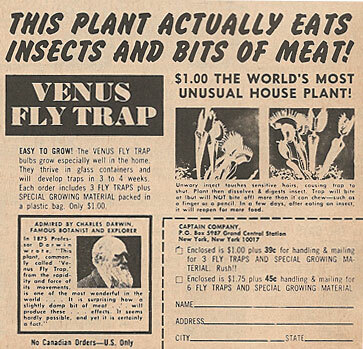 I remember growing up and seeing the ads in the back of comic books advertising meat-eating Venus Fly Traps (right alongside the ads for live pet monkeys), ads that sensationalized them as being little monsters. I tried many times to grow these amazing plants but with no luck. They always ended up withering and dying on me.